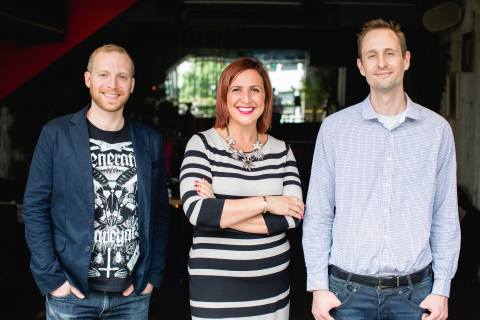 LONDON--(BUSINESS WIRE)--Phrasee, the London-headquartered marketing technology company that uses artificial intelligence (AI) to generate optimised marketing copy, has closed a $4m Series A funding round. The investment will fuel Phrasee’s international growth plans, including scaling up its new US operation in San Francisco and the recently announced expansion of its UK team. Albion Capital Group LLP led the round, with follow-on funds from existing investors including global digital communications business Next Fifteen PLC (Next 15) and angel syndicate Galvanise Capital. Next 15 and Galvanise announced their initial investments in 2016. Phrasee, which counts Virgin, Domino’s, Superdry and The Times amongst its clients, is the market leader in AI marketing language generation. It combines Natural Language Generation and Deep Learning to arm marketing teams with brand-compliant copywriting firepower. Phrasee’s AI writes email subject lines, Facebook & Instagram ads and push notifications that perform better than human-written versions, consistently delivering outstanding results for global brands. "We have a solid track record of supporting the expansion of high-performing UK businesses into the US and understand the formula for long-term success,” said Emil Gigov of Albion Capital, who will be joining Phrasee’s board. “Based on Phrasee’s commercial track record to date, client-focused culture, product leadership and the calibre of its ever-expanding team, we believe the company has an incredible future and are proud to be part of this next phase in its growth story." Phrasee was recognised by US-based CB Insights as 2017’s Most Innovative AI Company and more recently launched its AI ethics policy, one of the world’s first AI businesses to do so. As a leader in the AI space, Phrasee believes it is critical that its customers know how their technology and data will be used, and is calling on the wider industry to follow its lead. Saul Lopes, Virgin Holidays’ Client Lifecycle Lead, a flagship client of Phrasee since 2015, added, "We’ve been working with Phrasee from the start and it’s a fantastic company with a great vision, ethos and team. The product has transformed the way we think about marketing and I’m looking forward to seeing what comes next." About Phrasee: Phrasee is world-leading AI that generates and optimises marketing copy at scale, delivering improved results for email subject lines, push notifications, and Facebook and Instagram ads. Founded in 2015, Phrasee is the go-to solution for ambitious, intelligent and analytical marketers. Today, its team of data scientists, computational linguists and developers drive big results for enterprise brands across the globe, including a 57% click uplift for Domino’s, a 35% open uplift for Gumtree and millions of pounds in incremental revenue for Virgin Holidays. About Albion Capital: Albion Capital is a leading independent investment manager with a long-term record of partnering ambitious business. The Albion Group has funds of just over £1 billion under investment management or administration and has increasingly focussed on technology, specifically software and tech enabled services. Four Albion companies are represented in the 2017 Sunday Times Tech Track 100. Albion Capital Group LLP is authorised and regulated by the Financial Conduct Authority. About Next 15: Next 15 is a communications business which employs over 1,350 people across 32 offices in 14 countries. The Group incorporates 17 subsidiary agencies, spanning digital content, marketing, PR, consumer, technology, marketing software, market research, public affairs and policy communications. About Galvanise Capital: Galvanise Capital provides stimulating growth and go to market solutions for early stage businesses, and unique opportunities for early stage tech investors. Aside from Phrasee, their portfolio includes other high-growth MarTech businesses including Appsumer, Whichit, and Adimo.